This includes your big basic lifts: a front squat, deadlift, or back squat. Each of these big patterns challenge many different muscle groups, accomplishing a lot in a short period of time. If you are new to lifting, you lighter weights and more reps are recommended to learn the skill and allow your body to adapt slowly. Squash will typically put more stress on one side of the body. The off-season is an opportunity to create balance. Asymmetries can be natural and do have advantages but that if we can address and equalize strength from L to R it will help improve your lifting capacity. This includes a split squat, step up or my favourite, a single leg deadlift. The idea behind hot spot training is to identify the sports high load areas and your own previous injuries. If you hurt a shoulder or knee in the past you you train that area a bit more. 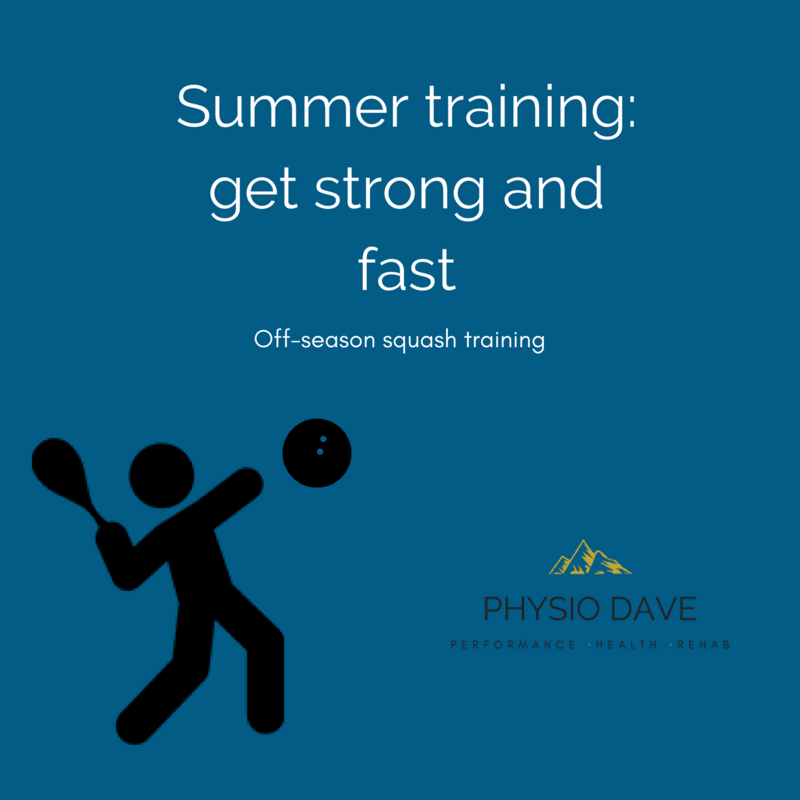 Squash is typically hard on the achilles, the knee, low back, and shoulder. By doing your base lifts, uni-lateral, and upper-body exercise you will target some of the hot spot areas. A simple calf raise or a groin related exercise might be nice additions as well. Hot spot training will have greater variability as prior injures will vary from athlete to athlete. Not an easy set of exercises to “jump” into but the benefits of sticking with a jumping program will pay off in speed gains (especially as we age and lose fast twitch fibres) and when done gradually will protect the tendons of the lower body. As I have tried to stress, these are principles to follow but in the end each athlete will have a unique set of needs and goals. Start training and see how one or all of these principles fit into your plan. Thanks for reading.